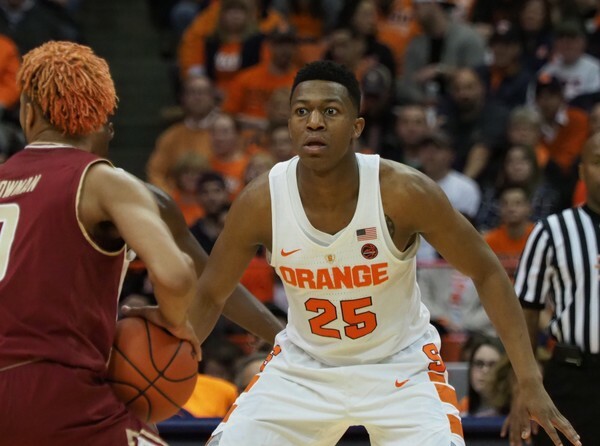 If Syracuse lost at Boston College Wednesday night it was going to hurt regardless. I mean after all the 85-70 defeat basically ended SU’s tournament hopes and season all together. However, this loss hurt even more because it was so unbelievably predictable. It was literally like watching this entire SU basketball season condensed down to one 40 minute game. 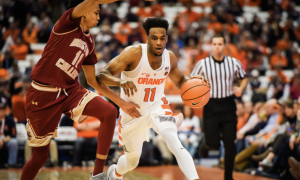 Tyus Battle carried the team with an NBA-level 29 point performance, Oshae Brissett racked up another double-double and SU’s offense looked stagnant, lethargic and inferior yet again. It’s been three on five all season and tonight was no different. In fact, the SU “big 3” literally scored all 37 first-half points and scored 64 of the 70 total points. That’s six freaking points from the other four players. That’s literally the type of stuff that happens on your kids elementary school rec team because half the team has never played basketball before. As for the defensive side of the ball, it was also more of the same for Syracuse. 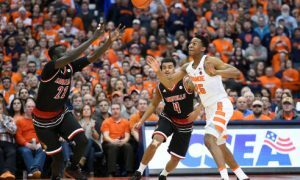 The Orange couldn’t get out on BC’s three-point shooters, failed to rotate properly and just looked flat out tired in the second half. The Eagles drilled almost 52% (14-27) of their three-point shots on the night and easily controlled the tempo of the game. Syracuse tried its best to disrupt that tempo with a press in the second half but simply didn’t have the stamina or depth. It was like watching a 2K team with all the players energy level down to 60 try to play defense for a majority of the night. 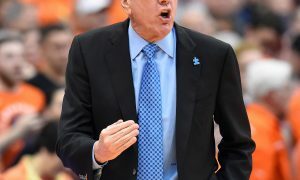 What's been SU's biggest flaw this season? So what made this game different from every other disappointing Syracuse loss this season? Well, unlike the Duke game last week where there was a clear talent gap, this one was there for the taking. After all, BC’s offense is extremely similar to SU’s. The Eagles have a clear “Big 3” and frankly a lack of talent outside of that (which only added insult to injury). Boston College just played like the Syracuse team everyone’s been begging for all season long. Instead of settling for isolation and having its strong backcourt just waste away the shot-clock by passing it back and forth at the top of the arch before settling for lazy jump-shots, BC actually moved the basketball (what a novel idea). They worked it around the perimeter, forced the zone to rotate and found the open man. As a result, the Eagles produced an offense that was actually pretty fun to watch, unlike the Orange. Who knows what’s next for SU. It honestly wouldn’t surprise me if Boeheim and company somehow found a way to beat Clemson Saturday to play its way back on the bubble. After all, it just feels like this team’s destiny to be sweating it out on Selection Sunday like it has been the past three years. Regardless if this loss was effectively the end of SU’s season, it really was a fitting way for the 2017-18 Orange to go out.